WELLINGTON, Fl., April 12, 2019----The World Polo League will end its successful inaugural 26-goal season on Sunday with what is expected to be one of the most exciting finals in its young history. Audi (Marc Ganzi, 2, Nic Roldan, 8, Pablo MacDonough, 10, Kris Kampsen, 6) will meet Colorado (Rob Jornayvaz, 2, Juan Martin Zubia, 7, Jero del Carril, 7, Adolfo Cambiaso, 10) in the Triple Crown of Polo championship at 4 p.m. at Grand Champions Polo Club Field 2. Gates open 2:30 p.m.
On a sweltering Thursday morning, Audi advanced with an impressive 13-9 victory over Valiente (Bob Jornayvaz, 2, Santi Torres, 6, Alejandro Taranco, 8, Pelon Stirling, 10) and Colorado advanced with a 13-11 win over Grand Champions (Grant Ganzi, 3, Juancito Bollini, 4, Rodrigo Andrade, 9, Juan Martin Nero, 10) at Valiente Polo Farm. Both teams are 4-0 and will play for $90,000 in WPL prize money. "To be able to be in that last big game at the end of the season is a great feeling," Roldan said. Audi will be making its second consecutive appearance in a WPL tournament final. 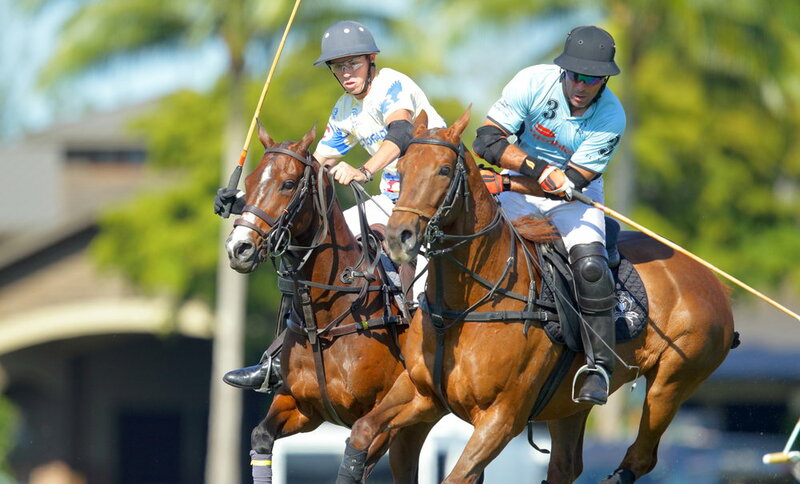 In the Palm Beach Open, Audi lost to SD Farms, 11-6, and Cambiaso was MVP. "It was a great day," Kampsen said. "It feels good. We came up with a plan last night at the team meeting, we stuck to it, we tried not to deviate and we had a good game. "It was hot, it was brutal, but the horses felt good, the team felt good, I felt like we were rotating well. These guys have a lot of faith in me and it makes me feel good. "Colorado is hell of a team, a really good young team," Kampsen said. "Cambiaso has two of the best up-and-coming players with him now, they are great players. Rob has been playing really well. Their games have been really fun to watch. Hopefully, we can make it unfun for them on Sunday." In a wide open, fast game, Audi went on the attack early for a 3-0 opening chukker. Valiente bounced back to outscore Audi 5-3 in the second and third chukkers to trail by only one at the half, 6-5. "I'm happy, I think the team is playing great," Roldan said. "Marc played an incredible game today, Pablo did as well. Kampsen was solid and I did what I had to do. The game was sticky in parts and I don't think it was our best game but we won." Audi's progress over three tournaments has been fun to watch. "It took us a while, we had to adjust and find our positions, we were a new team," Roldan said. "I had never played with Pablo. I played with Kampsen before when we were young and dipshits back in the day and never listened to each other and I played with Ganzi a lot. Now we have found our positions, are confident and having fun." Audi roared back in the second half, dominating the throw-ins and outscoring Valiente, 7-4, including a 5-1 fourth chukker behind MacDonough's three goals and Ganzi's two goals to give Audi an 11-6 lead going into the fifth chukker. Audi had a commanding 13-7 lead headed into the final chukker. "We regrouped at halftime and said let's find the open spaces," Ganzi said. "We switched the throw-ins and we started releasing the ball. The minute we started turning it into a running game the momentum shifted. "It's pretty simple," Ganzi said. "When we are able to get the ball in open spaces we are pretty lethal. When teams close us down in small quarters we get a bit desperate because we want the ball so badly. We just have to continue to do what we have done well all tournament which is defend and defend man-on-man. Colorado will be a real challenge for us." MacDonough led Audi with a team-high seven goals including two penalty conversions. Ganzi had four goals and Roldan added two. "I think we had some really good moments," MacDonough said. "We knew we had to play very well to win this game against Valiente. They are a great team, a great organization. I am happy the team went well. It's good to be in the final. We worked really hard to make the best possible for us. The whole team played well, everybody was helping each other and that's important." Audi has made a remarkable turnaround after going winless in the Founders Cup. "I am very happy to be in the most important game of the season," MacDonough said. "Anything can happen now but it's good to be there in the final with such a fun team." For Valiente, Stirling had a game-high eight goals including four penalty conversions. Taranco had one goal. "The Audi team is really good," Bob Jornayvaz said. "They just whooped up this morning. It was a fun, wide open game. The field played really well. Pablo played incredible. It's going to be a good final." Grand Champions gave Colorado everything it could handle for most of the game. The lead changed 10 times before Colorado tied the game at 10-10 when Zubia scored a goal off the throw-in. Colorado went on to score three unanswered goals to put the game away. "The sixth chukker we got pretty lucky with a couple of breakaways," Rob Jornayvaz said. "In the last two minutes we were up by three so at that point it was mostly about running out the time. "I think we knew it was going to be a super tough game, they are amazing," Jornayvaz said. "They have a good system with Rodrigo and Juanma coming back around and keeping the back powerful. Grant and Juan are really great up front whenever they receive the ball. They move the ball quickly and make good passes so you have to be on top of them all." Colorado jumped out to a 4-1 lead early in the third chukker. Grand Champions came back to tie, 4-4, on Nero's 60-yard penalty conversion with 3:48 left in the third chukker. Del Carril hit an incredible back shot to score and tie the game 5-5 at the half. Grand Champions took the lead, 7-5, late in the fourth chukker, 9-8 in the fifth and 10-9 early in the sixth before Colorado took control of the momentum. "I don't think there were any expectations we were going to win," Jornayvaz said. "We knew we could win. It was super tough on the field. It was a more difficult game than we expected. They had their game faces on today and were executing their strategy really well. I think we got pretty lucky so we are going to have to focus on keeping consistent for the final and hopefully we can take the whole thing away." Zubia led Colorado with a team-high six goals. Cambiaso had three goals and Jornayvaz and Del Carril each had two goals. "We can do better," Cambiaso said. "We still as a team did not play well. The good thing about it is we can still do much better. We need to watch the video because we made a lot of mistakes. "We still need to play better," Cambiaso said. "I know we can do better. That's the way I like to win. We pulled away in the sixth chukker. It's not right to play only one good chukker. We need to play better to win the tournament. That's the way I see it. "Grand Champions played amazing until the fifth. They had a couple of great goals. Juanma scored from 90 yards and Juancito Bollini had a great play and then we pulled it out in the last chukker playing amazing. It was the best chukker we play since we have been together. But we were lucky, one chukker is not good enough." Cambiaso knows Audi will be a formidable opponent. "They are a great team and playing amazing," Cambiaso said. "I think to win we need to play better as a team." Nero had a team-high six goals for Grand Champions. Bollini had three goals and Andrade added two goals. The Triple Crown of Polo, an ESPN2 television series, was created in 2005 by David McLane, known for Pro Beach Hockey, Women of Wrestling and Gorgeous Ladies of Wrestling, to help promote polo in the U.S. The show was seen in 129 countries. The spectacular trophy was created for the event that had stops at the Sarasota Polo Club, Las Colinas Polo Club in Dallas and Santa Barbara Polo Club; the first year in 2006 and Sarasota and New Bridge Polo and Country Club in Aiken, S.C. in 2007 during its heyday before it went on hiatus. After a day off on Friday, World Polo League action resumes Saturday with the US Trust Cup at 4 p.m. at Valiente Polo Farm Field 1. Alegria (Freddie Mannix, 8, Jesse Bray, 6, Santi Wulff, 5, Juan Martin Obregon, 5) will play WPL (Poroto Cambiaso, 3, Santi Torres, 6, Guillermo Terrera, 8, Diego Cavanagh) in the Triple Crown of Polo subsidiary game. Alegria will be looking for its second 26-goal tournament win. Alegria won the Palm Beach Open subsidiary Molina Cup with an 11-10 victory over Valiente in the final minute.